Breckenridge, Colorado. 9,500 feet above sea level. Deep snow angled against the studio, more white falling from the sky, a swirling winter wonderland. 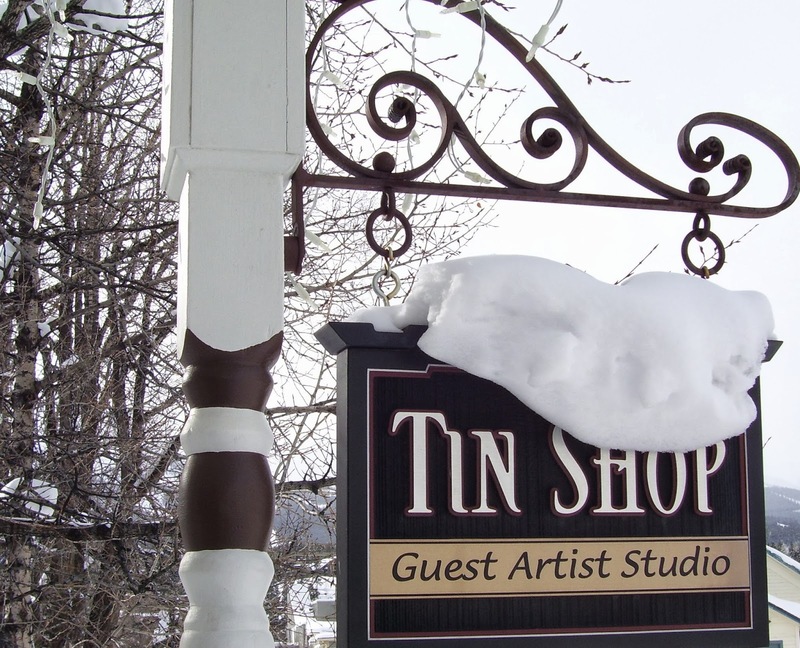 I've made myself at home in the historic Tin Shop, which was bought and renovated by the town's well endowed Arts/Historic District and is now offered as a cozy guest artist's live/work space. I was a resident here in 2009 and had the good fortune of being invited back for the month of February. I am now in the midst of 25+ days to make all the art I can make - and I'm off and running!! 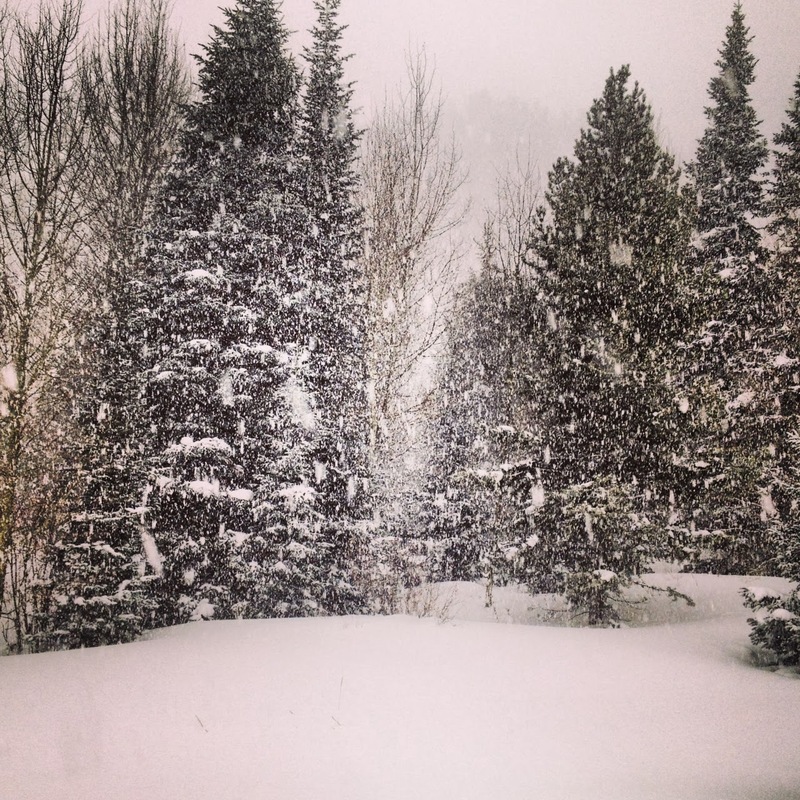 Winter in Breckenridge... snowy Wonderland!!!! As always, I've come bearing some notion of my intended projects, but I always allow myself to follow creative tangents as they arise. It's a bit like tracking an animal through the forest on a winter's day, fun and then fruitless, hopeful and maddening! Now on my ninth official artist's residency program, I've learned that this is the best time to explore brand new creative ideas and to allow myself to wander into uncharted territory with complete abandon. Since I work in a variety of different media, this can lead to some frantic overwhelm - along with sleepless nights - but I am going with it!! 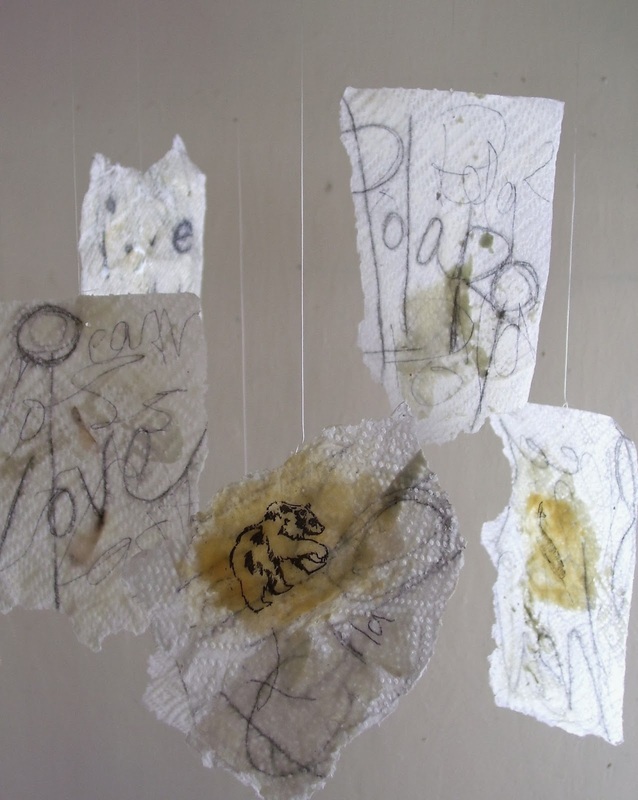 "Earth/Ice Listening" -- Studio installation in progress with encaustic wax, discarded paper towels, charcoal, xerox transfer and pencil drawing. 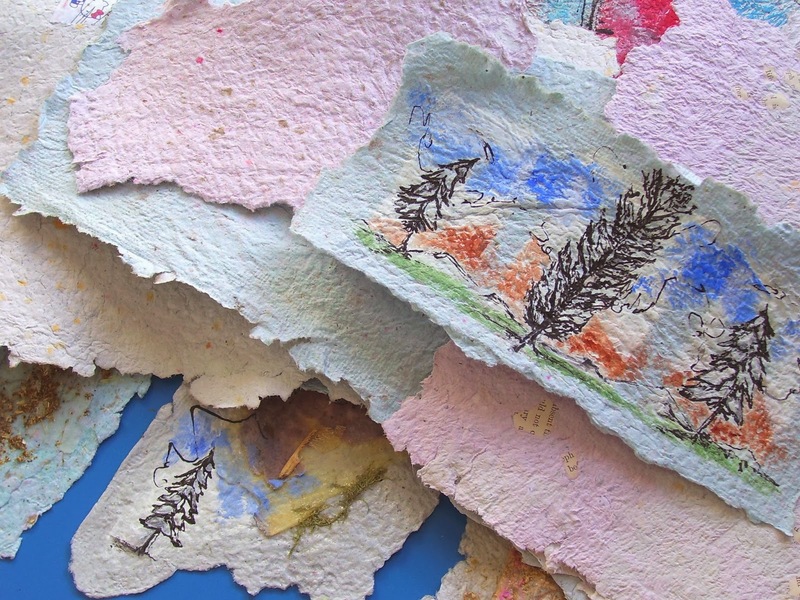 "Tea Series/Mindfulness" -- work in progress -- discarded tea/bags, Usnea, map, paper towel, beeswax, damar resin, box elder seeds, and ink on paper handmade from old lists, fliers, junk mail. 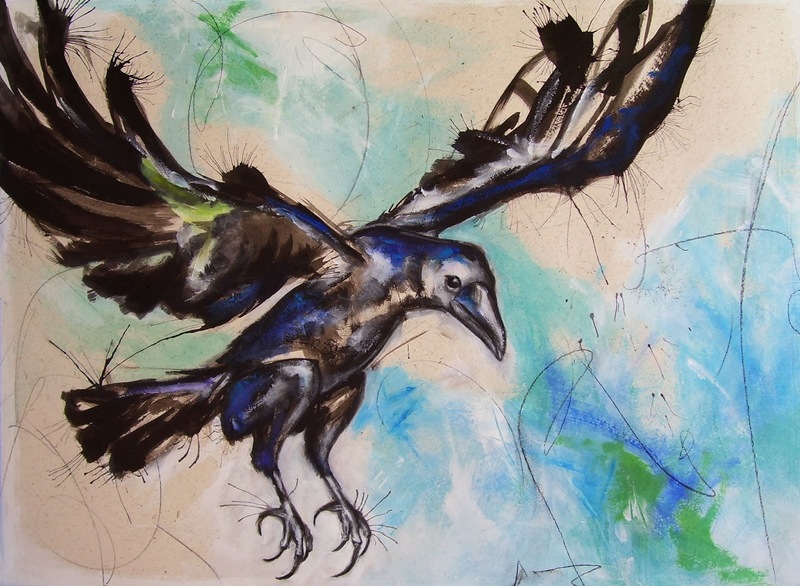 Along with developing new projects, I've also finished a large commission piece for a buyer who shares my appreciation of raptors and other winged things: Tulugaq/Raven, whose range takes her into the Arctic. I'm currently working on a second commissioned painting, Falling into Blue, which is a creative exploration of color, feeling, and possibility. As a friend writes, "the breezy surface pulls you in... and then you fall into the mystery." To me, blue is the essence of what I found in the very far north - rock and ice, sea and sky - and a reflection of the world that lives inside us all. A pile of my hand made paper in the Tin Shop. Such pleasure in recycling my To-Do lists into creativity!! I'm exploring more ideas about Greenland and the Arctic; about land-earth-ice, climate-environment-ecology, human relationships and how the din of our lives can keep us from hearing feeling seeing knowing. I also find myself creating simple works of art that are - essentially - a celebration of life and aliveness. 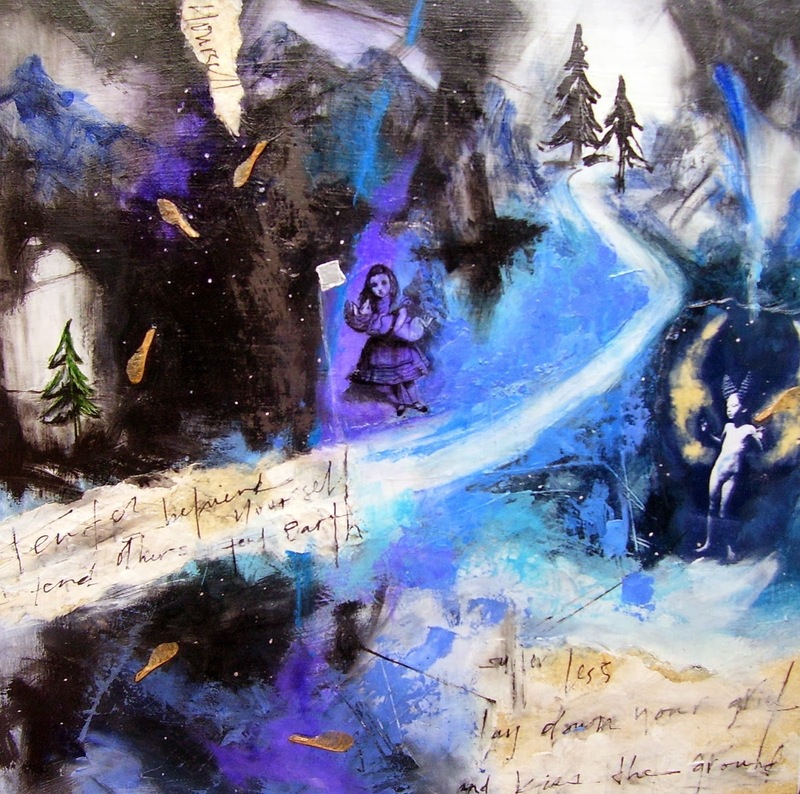 The beautiful miracle of it all, like a love letter to Greenland penciled around the girth of the planet. I've also discovered a relationship between Breckenridge - this cute snowbound ski town in the high Rockies - and the Arctic: our climate delivers the possibilities of change more swiftly to those places that are either high up, or far up. Altitude vs. latitude. Here the snow drives fast and hard, while at home in southwest Colorado, drought is the hallmark of the current winter season. What next? ?